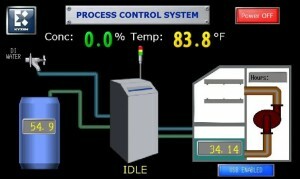 The first and only concentration monitoring and control system in the world with comprehensive ANALYST Data Services. The KYZEN PCS controls wash bath concentration automatically so you don’t have to. KYZEN PCS monitors and automatically reacts to the dynamic changes in the wash bath. Over 20 years ago, KYZEN PCS was designed to maximize high quality output from inline cleaning systems, and its capabilities have continuously improved and advanced. Today, it is remains the only complete concentration monitoring and control system available in the world. The latest KYZEN PCS features improved control algorithms and a new, 7” color touchscreen interface. Enabled with KYZEN ANALYST Data Services, engineers can even check-in on the system remotely using their smartphone or tablet through a secure network connection. Multiple facilities and locations are now easy to manage with remote data access in custom dashboards. ANALYST Data Services feeds real time wash bath concentration data automatically. For customers who purchased their KYZEN PCS prior to October 2017, call or email us now to find out how easy it is to have ANALYST Data Services enabled on your system.